One of the magazines was a real score - several features on kid surfers! So I chose pics of other little blond guys that he could really relate to. 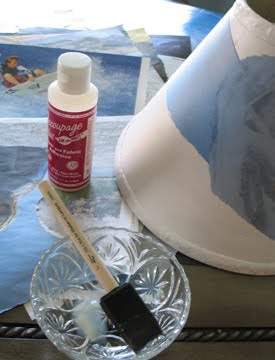 My daughter did all the brushing on of the decoupage glue and was so thrilled to be making little brother a "secret surprise!" 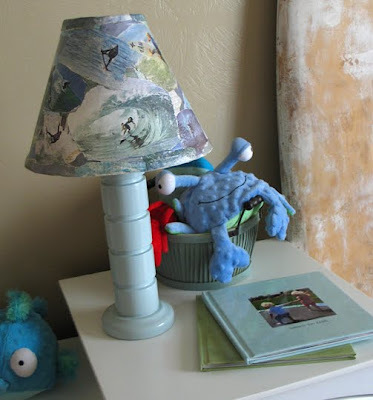 I sealed the decoupaged lamp shade with two spray coats of clear satin polycrylic; painted the lamp base with a few coats of "Beach House" from Valspar Waverly Home Classics (same color used elsewhere in his room and the playroom photo canvases); and now it's all dry and waiting for tonight's story time! Very nicely done. 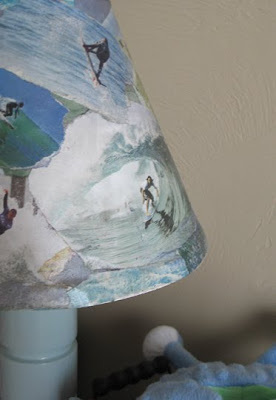 I need to work with decoupage more until I "get" it. I have several projects I would like to do. 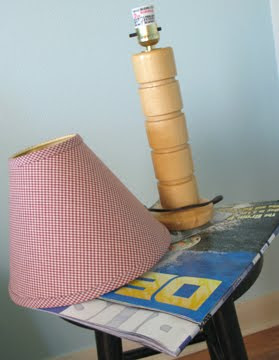 I love your design I also love to make decoupage too. This is so cute!! Love this idea for a room theme! Very clever and different! That is just too cute! We are about to embark on a grown up room make over for our almost 12 year old girl and I am so very at a loss. Pink and frilly was a whole lot easier than almost teen!!! Thanks for the inspiration! 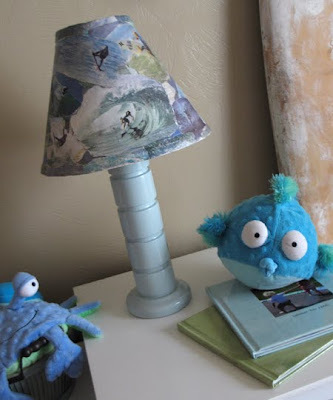 She's already hacked all the fluff off her lampshade - snipped those beads right off one day! I'll have to look for something she can decoupage with things that make her heart sing! Can't wait to see little dude's room, and also little dude and his sister.